It’s Easter. It’s April Fool’s. It’s interesting Amber time. This necklace is very old Amber: an oxymoronical statement since to be Amber, it has to be fossilized resin of extinct pine trees dating back 40 million years. 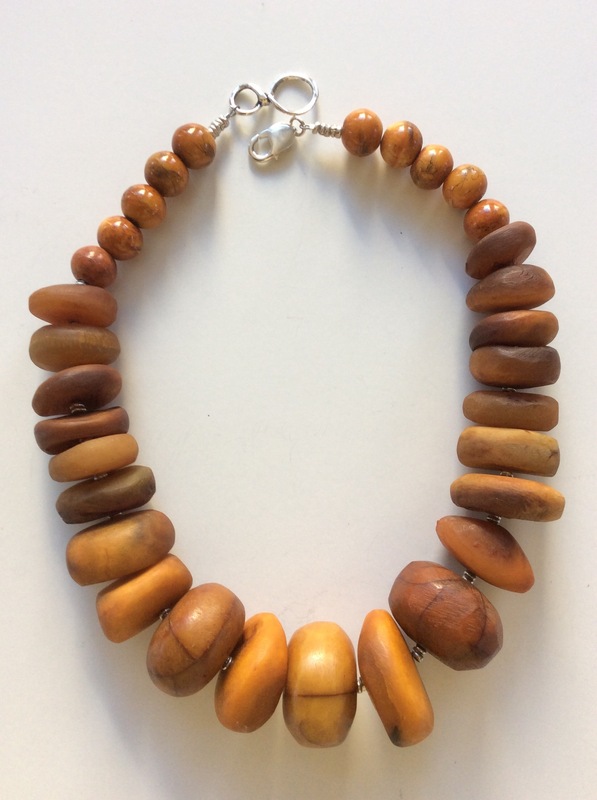 This mixed necklace contains three antique natural extra-large Moroccan Baltic Butterscotch Amber beads at the center and two out from the center. To clarify the oxymoron, they are Baltic Amber, by definition very old, but also antique since they were crafted into this shape over 100 years ago in Morocco. Therefore, they are also rare. Etsy has an overflow of amber pieces, but only one with these three beads in it; they price out at $166 each. 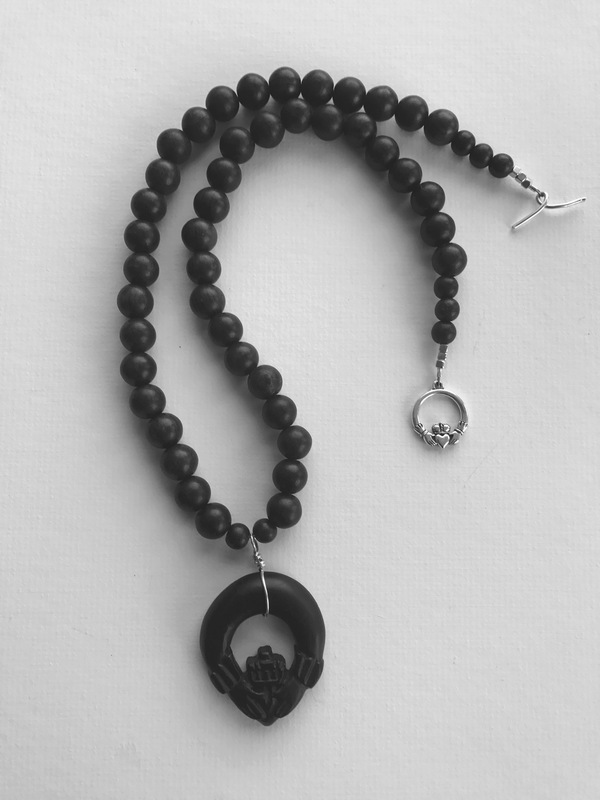 The remaining 18 beads are Ram’s Horn, also made in Morocco, also antique, also natural. Their patina is even more interesting: cracks and dryness which I assume are from the dry mountainous air of the nomadic Berbers who traded in beads. Their colors are in vibrant shades of amber. The ram has been a popular theme in jewelry and adornment since the Phoenicians of the 6th century BC. I still wear my ram’s horn gold earrings from the 1980’s. 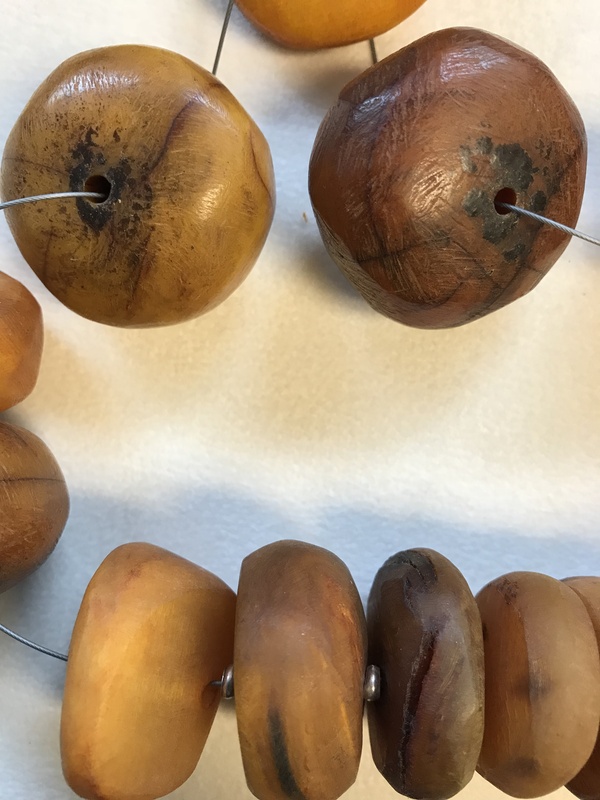 On many large Amber beads, signs of testing are visible as round black marks near the hole. See details in two beads to left. 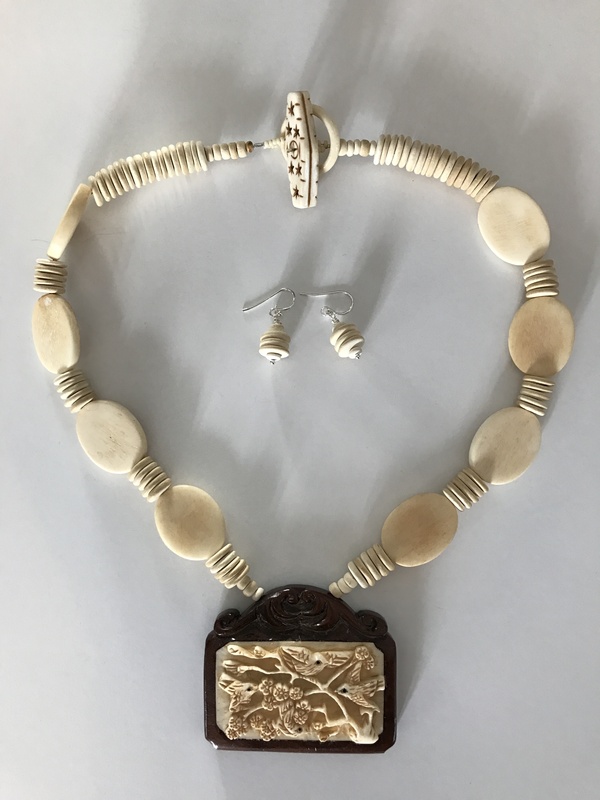 The trader would prove the authenticity of his beads by applying a hot needle: if it cannot penetrate the surface and if the contact smells of soot, it is real Amber. Other resins would allow the needle to easily go into the bead and smell of fresh pine. Finishing this necklace are some small Chinese wood beads with miniature landscapes etched in black ink, chosen for the overall shade of amber dye to extend my color theme. Notice sterling silver spacers and interesting circle with a lobster clasp. Wear your silver earrings. Berbers are indigenous to North Africa, especially Algeria and Morocco, living there as farmers since the Phoenician times. They were also traders, although not as famous as the later Tuareg tribes discussed in my blog of March 22, 2017. 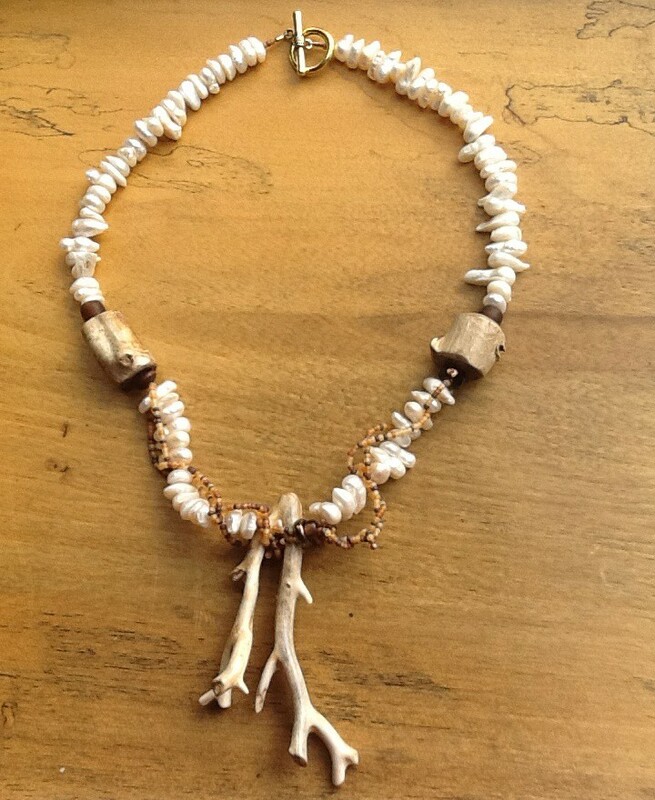 The necklace is named “DIALOGUE” and is 21.5” long. The widest bead is 1.25” and the toggle is 2.75” long. I recommend chunky silver earrings with this necklace. 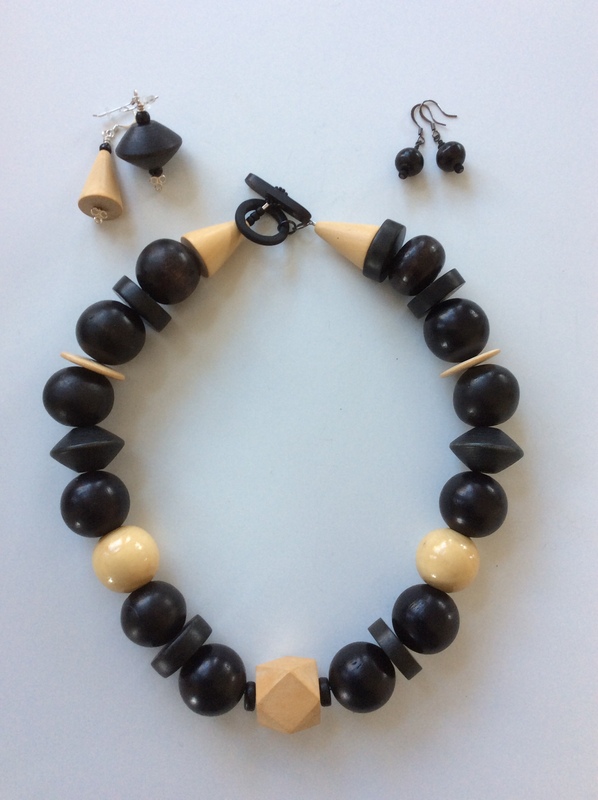 It is very chunky, but not very heavy due to the lightness of wood beads. It is $139 which includes shipping and insurance. For years, I have been designing a style of necklace I call “One of a Kind” or, in my shorthand, OOK. They originated from chunky orphan beads, leftover onesie or twosie charmers, tossed into a box. One day a necklace designed itself in that box and my first OOK emerged. They feature as many different beads as possible: it’s a fun challenge not to repeat beads, even though I do allow myself to for superior design. I’ve probably made 30 of them since I declared myself a bead jewelry artist in 1995. But it took gallerist, Gail Sewell reminding me how much she likes them, to get me habitually thinking about OOKs. Now she gets first dibs for her Chambers Gallery in Cambria, CA! 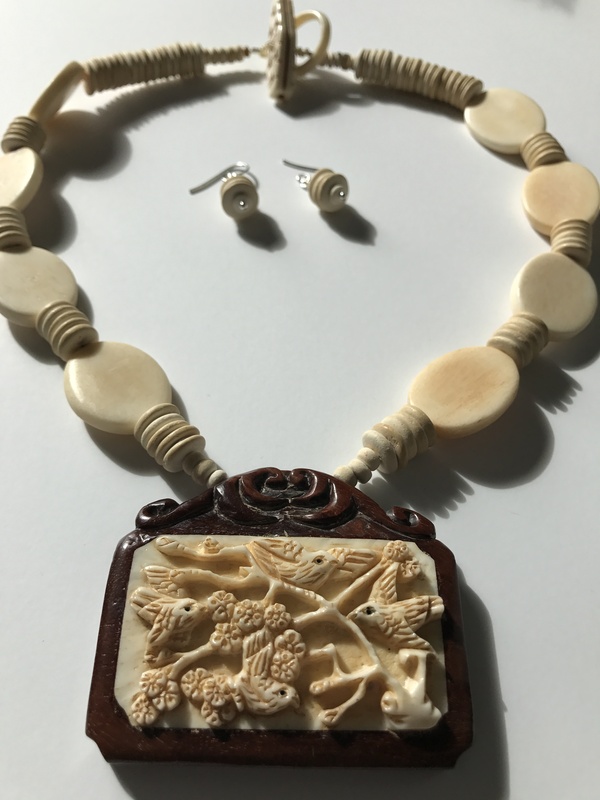 This necklace’s genesis was five large wood beads (from the top: an ebony and resin assemblage; a bird’s eye in soft wood; coco as in coconut; a finely carved snake which in Chinese mythology signifies cleverness; then another coco). A notable bead is the obelisk-shaped carved soapstone with images of a stylized fish. 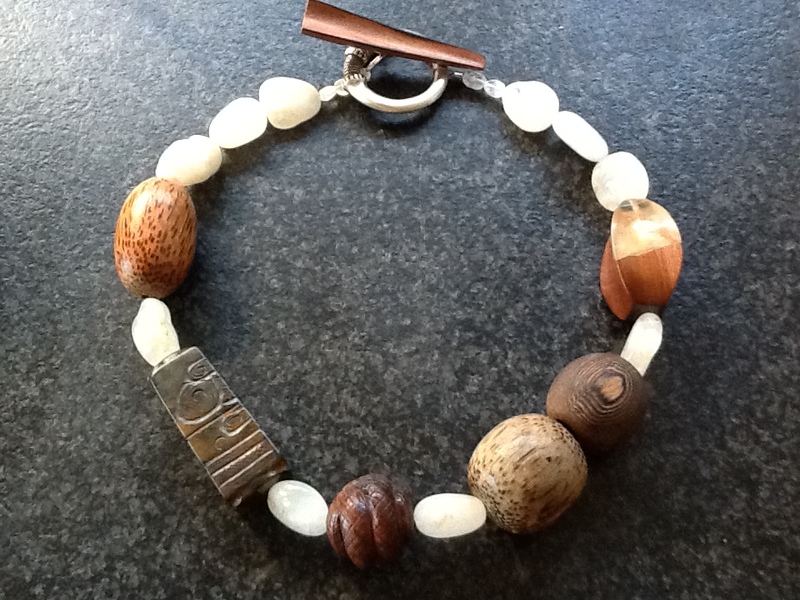 Balancing the wood are some opaque rock crystal beads with subtle brown markings. This OOK demanded a striking clasp with a solid silver ethnic circle. The wood toggle, formerly known as a button, I found with my knitter friends, Tess and Dottie, on a fun driving trip to Webs, the biggest yarn shop ever. 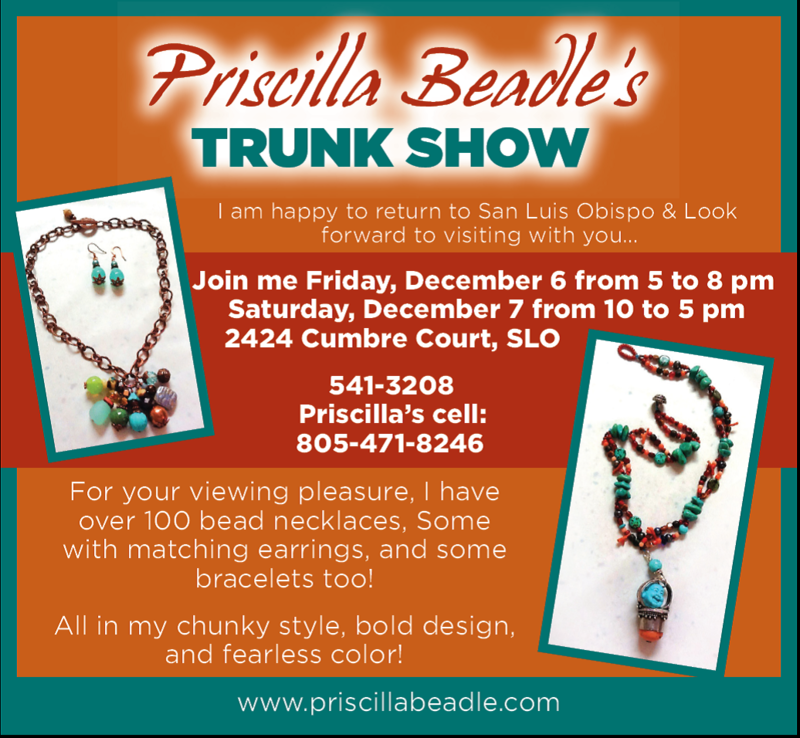 REGARDING MY MURANO BEADS, stay tuned. I’ve designed only one necklace, a fairly “safe” medallion, pictured below, because the big unique beauties I selected in Italy are currently intimidating me. They have to be fabulous, and they will be, but they need to take their time. 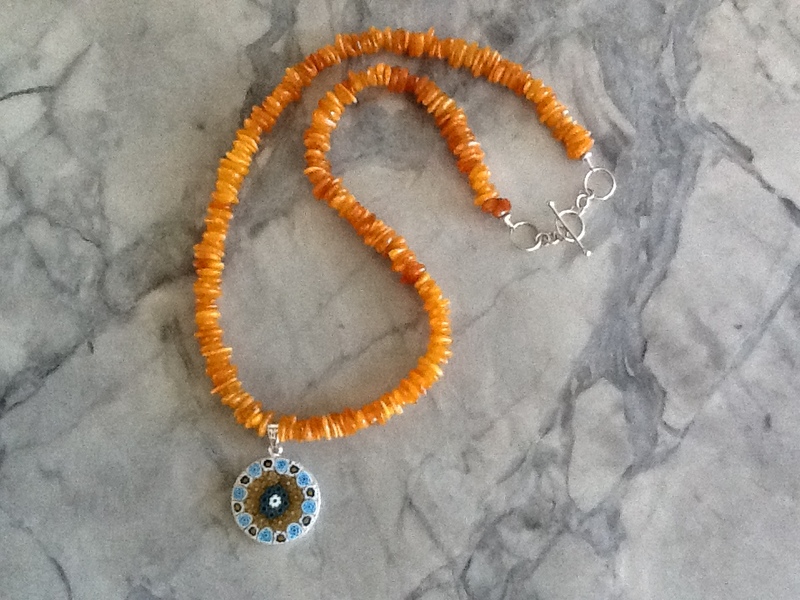 Murano millefiori disc bezeled in sterling silver, with Baltic amber chips and sterling silver clasp; 18.5” to 19” adjustable length. Priced at $99 including shipping and insurance.